The famous 10 principles finally get the notebook treatment. Any designer worth their salt will be aware of Dieter Rams and his 10 principles of good design. Thought up by the German industrial designer in the '70s as he tried to answer the question 'is my design a good design? ', these principles have proved to be a valuable guide for creatives over the years. 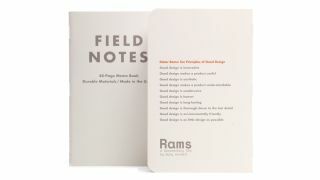 To celebrate Rams's design thinking and commemorate a new documentary about him by Gary Hustwit, Field Notes has launched a limited edition range of Rams memo books. Sold in packs of three for $12.95, the FN-RAMS collection takes its inspiration from the designer's teaching by making a product that is useful, aesthetic and thorough down to the last detail. Ram's iconic products also helped to shape the books, as the orange and white colour scheme is taken in part from his 1958 Braun T3 Transistor Radio. This radio would go on to influence the look of the iPod, so this Field Notes book is in good design company. Inside each book you'll find pages with light grey Dot-Graph paper to help record your thoughts and ideas, while the covers are finished with a soft-touch varnish that gives the books a luxurious feel and helps to keep the pages safe. The ten design principles themselves can be found on the back cover, making them easy to find in case you need a refresher or a burst of creative inspiration. If you want to pick up one of these limited edition notebooks be sure to head along to a screening of Rams, the documentary portrait of Dieter Rams (watch the trailer above). Alternatively, you can buy them directly from the Field Notes site. Just be sure you don't hang around: once they're gone, they're gone.